Lightly butter a 20x30cm (12x8in) baking sheet. Set aside. Put 2 ¼ cups (315g) flour into a bowl with the salt, sugar and yeast and mix together. Beat the eggs and add them, with the vanilla, zest and nutmeg to the lukewarm milk. Stir the liquid ingredients into the dry ingredients to make a sticky medium-soft dough, being prepared to add more flour if necessary. Work in the butter and knead by hand for about 10 minutes or half the time by machine. The dough should be smoother and springier when done. Put into a lightly oiled large bowl, cover with plastic wrap and leave to double somewhere warm for 1 hour-1 hour30min. When ready, punch down and stretch out to fit the prepared sheet. Leave to prove for 15-20 minutes – in the meantime, preheat the oven to 200°C/400°F. Peel, core and chop the apples finely. Beat the egg, cream and nutmeg together and brush over the proved dough, then spread the apples over the top. Mix the sugars and allspice then sprinkle over the fruit. Top with the flaked almonds and bake for 15 minutes; reduce the oven to 180°C/350°F and bake for another 10-15 minutes or until golden and cooked within. Make a runny paste with the topping ingredients and drizzle over the kuchen after you remove it from the oven. 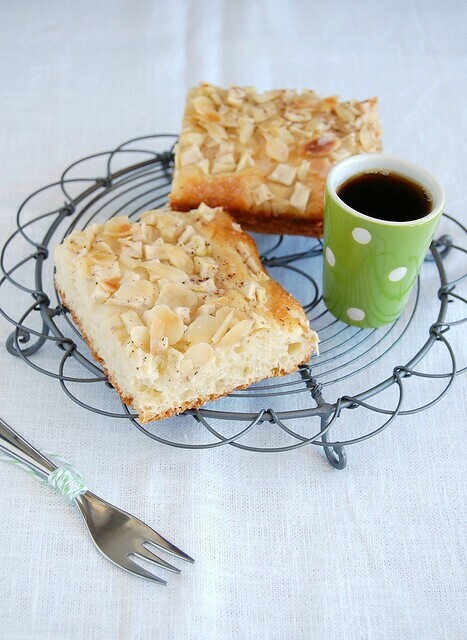 Beautiful kuchen, I love the almond topping! Delicious! I am excited about her new cookbook also. Even though I would have love to see some blueberries in these, I still love apples in desserts. I totally want one!